Given the county's proximity to Washington, D.C., Arlington is headquarters to many departments and agencies of the federal government of the United States, including the Pentagon, the Department of Defense, the United States Drug Enforcement Administration, the Defense Intelligence Agency and the Defense Advanced Research Projects Agency (DARPA). The many federal agencies, government contractors, and service industries contribute to Arlington's stable economy, which has made it one of the highest-income counties in the United States. Arlington is also the location of national memorials and museums, including Arlington National Cemetery, the Pentagon Memorial, the Marine Corps War Memorial, and the United States Air Force Memorial. The area that now forms Arlington County was originally part of Fairfax County in the Colony of Virginia. Land grants from the British monarch were awarded to prominent Englishmen in exchange for political favors and efforts at development. One of the grantees was Thomas Fairfax, 6th Lord Fairfax of Cameron whose lends his name to both Fairfax County and the City of Fairfax. The name Arlington comes from Henry Bennet, 1st Earl of Arlington whose name had been applied to a plantation along the Potomac River. George Washington Parke Custis, grandson of First Lady Martha Washington, acquired this land in 1802. The estate was eventually passed down to Mary Anna Custis Lee, wife of General Robert E. Lee. The property later became Arlington National Cemetery during the American Civil War, and now lends its name to present-day Arlington County. The area that now contains Arlington County was ceded to the new United States federal government by the Commonwealth of Virginia. With the passage of the Residence Act in 1790, Congress approved a new permanent capital to be located on the Potomac River, the exact area to be selected by President George Washington. The Residence Act originally only allowed the President to select a location within Maryland as far east as what is now the Anacostia River. However, President Washington shifted the federal territory's borders to the southeast in order to include the pre-existing city of Alexandria at the District's southern tip. In 1791, Congress amended the Residence Act to approve the new site, including the territory ceded by Virginia. However, this amendment to the Residence Act specifically prohibited the "erection of the public buildings otherwise than on the Maryland side of the River Potomac." As permitted by the U.S. Constitution, the initial shape of the federal district was a square, measuring 10 miles (16 km) on each side, totaling 100 square miles (260 km2). During 1791–92, Andrew Ellicott and several assistants placed boundary stones at every mile point. Fourteen of these markers were in Virginia and many of the stones are still standing. When Congress arrived in the new capital, they passed the Organic Act of 1801 to officially organize the District of Columbia and placed the entire federal territory, including the cities of Washington, Georgetown, and Alexandria, under the exclusive control of Congress. Further, the unincorporated territory within the District was organized into two counties: the County of Washington to the east of the Potomac and the County of Alexandria to the west. This Act formally established the borders of the area that would eventually become Arlington but the citizens located in the District were no longer considered residents of Maryland or Virginia, thus ending their representation in Congress. Residents of Alexandria County had expected the federal capital's location to result in land sales and the growth of commerce. Instead the county found itself struggling to compete with the Chesapeake and Ohio Canal at the port of Georgetown, which was farther inland and on the northern side of the Potomac River next to the City of Washington. Members of Congress from other areas of Virginia also used their power to prohibit funding for projects, such as the Alexandria Canal, which would have increased competition with their home districts. In addition, Congress had prohibited the federal government from establishing any offices in Alexandria, which made the county less important to the functioning of the national government. Alexandria had also been a major market in the American slave trade, and rumors circulated that abolitionists in Congress were attempting to end slavery in the District; such an action would have further depressed Alexandria's slavery-based economy. At the same time, an active abolitionist movement arose in Virginia that created a division on the question of slavery in the Virginia General Assembly. Pro-slavery Virginians recognized that if Alexandria were returned to the Commonwealth, it could provide two new representatives who favored slavery in the state legislature. During the American Civil War, this division led to the formation of the state of West Virginia, which comprised the 55 counties in the northwest that favored abolitionism. Largely as a result of the economic neglect by Congress, divisions over slavery, and the lack of voting rights for the residents of the District, a movement grew to return Alexandria to Virginia from the District of Columbia. From 1840 to 1846, Alexandrians petitioned Congress and the Virginia legislature to approve this transfer known as retrocession. On February 3, 1846, the Virginia General Assembly agreed to accept the retrocession of Alexandria if Congress approved. Following additional lobbying by Alexandrians, Congress passed legislation on July 9, 1846, to return all the District's territory south of the Potomac River back to the Commonwealth of Virginia, pursuant to a referendum; President James K. Polk signed the legislation the next day. A referendum on retrocession was held on September 1–2, 1846. The residents of the City of Alexandria voted in favor of the retrocession, 734 to 116; however, the residents of Alexandria County voted against retrocession 106 to 29. Despite the objections of those living in Alexandria County, President Polk certified the referendum and issued a proclamation of transfer on September 7, 1846. However, the Virginia legislature did not immediately accept the retrocession offer. Virginia legislators were concerned that the people of Alexandria County had not been properly included in the retrocession proceedings. After months of debate, the Virginia General Assembly voted to formally accept the retrocession legislation on March 13, 1847. In 1852, the Virginia legislature voted to incorporate a portion of Alexandria County to make the City of Alexandria, which until then had been only been considered politically as a town. Arlington County is located at 38°52′49″N 77°06′30″W? / ?38.88028°N 77.10833°W? / 38.88028; -77.10833 and is surrounded by Fairfax County and the Falls Church to the southwest, the City of Alexandria to the southeast, and Washington, D.C. to the northeast directly across the Potomac River, which forms the county's northern border. Other landforms also form county borders, particularly Minor's Hill and Upton's Hill on the west. According to the U.S. Census Bureau, the county has a total area of 26 square miles (67.3 km2), of which about 4.6 square miles (11.9 km2) is federal property. The county is roughly in the shape of a rectangle 4 miles (6.4 km) by 6 miles (9.7 km), with the small end slanting in a northwest-southeast direction. All cities within the Commonwealth of Virginia are independent of counties, though towns may be incorporated within counties. However, Arlington has no existing incorporated towns because Virginia law prevents the creation of any new municipality within a county that has a population density greater than 1,000 persons per square mile. Its county seat is the census-designated place (CDP) of Arlington, which is coterminous with the boundaries of the county; however, the county courthouse and most government offices are located in the Courthouse neighborhood. In 2002, Arlington received the EPA's National Award for Smart Growth Achievement for "Overall Excellence in Smart Growth. " In 2005, the County implemented an affordable housing ordinance that requires most developers to contribute significant affordable housing resources, either in units or through a cash contribution, in order to obtain the highest allowable amounts of increased building density in new development projects, most of which are planned near Metrorail station areas. A number of the county's residential neighborhoods and larger garden-style apartment complexes are listed in the National Register of Historic Places and/or designated under the County government's zoning ordinance as local Historic Preservation Districts. These include Arlington Village, Arlington Forest, Ashton Heights, Buckingham, Cherrydale, Claremont, Colonial Village, Fairlington, Lyon Park, Lyon Village, Maywood, Penrose, Waverly Hills and Westover. Many of Arlington County's neighborhoods participate in the Arlington County government's Neighborhood Conservation Program (NCP). Each of these neighborhoods has a Neighborhood Conservation Plan that describes the neighborhood's characteristics, history and recommendations for capital improvement projects that the County government funds through the NCP. Arlington has consistently had the lowest unemployment rate of any jurisdiction in Virginia. The unemployment rate in Arlington was 4.2% in August 2009. 60% of office space in the Rosslyn-Ballston corridor is leased to government agencies and government contractors.There were an estimated 205,300 jobs in the county in 2008. About 28.7% of these were with the federal, state or local government; 19.1% technical and professional; 28.9% accommodation, food and other services. In 2010, there were an estimated 90,842 residences in the county. In 2000, the median single family home price was $262,400. About 123 homes were worth $1 million or more. In 2008, the median home was worth $586,200. 4,721 houses, about 10% of all stand-alone homes, were worth $1 million or more. 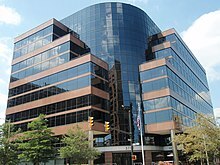 A number of federal agencies are headquartered in Arlington, including the Air Force Office of Scientific Research, DARPA, Drug Enforcement Administration, Foreign Service Institute, National Science Foundation, Office of Naval Research, Transportation Security Administration, United States Department of Defense, United States Fish and Wildlife Service, United States Marshals Service, and the United States Trade and Development Agency. Companies headquartered in Arlington include AES, Allbritton Communications Company, Alcalde and Fay, Arlington Asset Investment, CACI, Corporate Executive Board, ENVIRON International Corporation, ESI International, FBR Capital Markets, Interstate Hotels & Resorts, Rosetta Stone and Strayer Education. Organizations located here include Associated General Contractors, The Conservation Fund, Conservation International, the Consumer Electronics Association, The Fellowship, the Feminist Majority Foundation, the Insurance Institute for Highway Safety, the National Rural Electric Cooperative Association, The Nature Conservancy, the Public Broadcasting Service, United Service Organizations and the US-Taiwan Business Council. Arlington National Cemetery is an American military cemetery established during the American Civil War on the grounds of Confederate General Robert E. Lee's home, Arlington House (also known as the Custis-Lee Mansion). It is directly across the Potomac River from Washington, D.C., north of the Pentagon. With nearly 300,000 people buried there, Arlington National Cemetery is the second-largest national cemetery in the United States. The Tomb of the Unknowns, also known as the Tomb of the Unknown Soldier, stands atop a hill overlooking Washington, DC. President John F. Kennedy is buried in Arlington National Cemetery with his wife and some of their children. His grave is marked with an "Eternal Flame." His brothers, Senators Robert F. Kennedy and Edward M. Kennedy, are also buried nearby. Another President, William Howard Taft, who was also a Chief Justice of the U.S. Supreme Court, is the only other President buried at Arlington. The building is pentagon-shaped in plan and houses about 23,000 military and civilian employees and about 3,000 non-defense support personnel. It has five floors and each floor has five ring corridors. The Pentagon's principal law enforcement arm is the United States Pentagon Police, the agency that protects the Pentagon and various other DoD jurisdictions throughout the National Capital Region. Built during the early years of World War II, it is still thought of as one of the most efficient office buildings in the world. It has 17.5 miles (28 km) of corridors, yet it takes only seven minutes or so to walk between any two points in the building. The open-air central plaza in the Pentagon is the world's largest "no-salute, no-cover" area (where U.S. service members need not wear hats nor salute). The snack bar in the center is informally known as the Ground Zero Cafe, a nickname originating during the Cold War when the Pentagon was targeted by Soviet nuclear missiles. During World War II, the earliest portion of the Henry G. Shirley Memorial Highway was built in Arlington in conjunction with the parking and traffic plan for the Pentagon. This early freeway, opened in 1943, and completed to Woodbridge, Virginia in 1952, is now part of Interstate 395. Through an agreement with Fairfax County Public Schools approved by the school board in 1999, up to 26 students residing in Arlington per grade level may be enrolled at the Thomas Jefferson High School for Science and Technology in Fairfax at a cost to Arlington of approximately $8000 per student. For the first time in 2006, more students (36) were offered admission in the selective high school than allowed by the previously established enrollment cap. M arymount University is the only university with its main campus located in Arlington. Founded in 1950 by the Religious of the Sacred Heart of Mary as Marymount College of Virginia, both its main campus and its Ballston Center are located on North Glebe Road, with a shuttle service connecting the two.